Tarts, whether savory or sweet, are one of my most favorite things to bake. Indeed, crafting tarts is a several-step process that makes me feel like I’m working on an exciting project (which, in my book, definitely makes cooking more fun!). Plus the results are always as gorgeous as they are delectable. This pear tart meets all those requirements and more. There are most definitely several steps to this recipe: making the crust, whipping up the frangipane, slicing the pears to perfection and whisking a Chantilly until it’s airy as a cloud. And when you’re all done, the tart looks absolutely stunning. A light, crumbly tart shell lets the other ingredients shine! But what I love even more here is the combination of flavors. The hazelnut frangipane is light, yet bursting with the essence of the toasted nuts – it makes for a marvelous pairing with the juicy pears! The tart shell gives the dessert the foundation it needs, but it’s so crumbly and light that you barely notice it’s there. 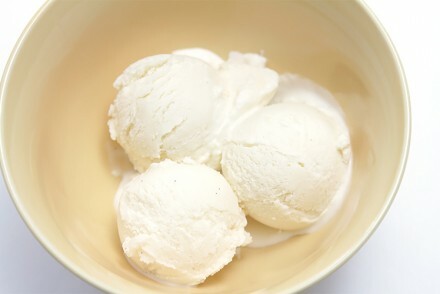 And the touch of cardamom in the Chantilly brings a tantalizing, exotic aroma to every spoonful. So here’s to an elegant tart that will elevate any dinner party, or holiday feast, to heavenly heights. This exquisite dessert needs a dessert wine that pairs with both the pears and the hazelnuts, but that isn’t cloyingly sweet. Try a fizzy Moscato d’Asti from Northwest Italy, a perfumed Muscat de Beaumes-de-Venise from Southern Rhône, or Bonny Doon Vineyard’s outstanding “Vinferno.” This wonderful offering from Bonny Doon is brimming with fall fruit and hazelnut notes – what could be more perfect with this pear tart!? Step 1: Make this pastry dough, shaping the dough into a 7″-long, 2″-wide and 1 1/2″-thick log before refrigerating the dough. Roll dough into a 16″ x 7″ rectangle. Bake the tart blind as per the instructions before proceeding with this recipe. Step 2: To make the Chantilly – Place the heavy cream, sugar, vanilla and cardamom in the bowl of an electric mixer and whip at medium speed until thick and ribonny. Refrigerate until ready to use. Step 3: To make the frangipane – Place the hazelnuts and sugar in the bowl of a food processor and process until the hazelnuts are very finely ground. Transfer to the bowl of an electric mixer. Add the soft butter and Poire William. Whip at medium speed until the mixture is creamy, about 1 minute. Add the egg and continue whipping at medium speed until thick and ribonny, about 2 more minutes. Spread the hazelnut frangipane in the prepared tart shell. 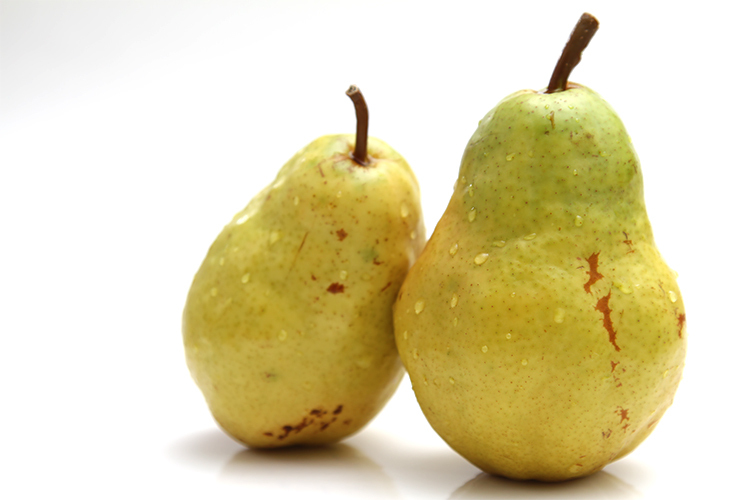 Peel the pears, trim both ends, then cut each pear in half lengthwise and core them. Slice each half lengthwise into 1/4″ slices, holding the slices together as you slice them. Slightly spread the slices and arrange them on top of the frangipane. Step 4: Place the cold butter, Poire William, lemon juice and sugar in a small saucepan. Heat over medium heat until the sugar has dissolved and the mixture starts to foam, stirring continuously. Transfer to a small bowl and brush the pears with half the mixture. 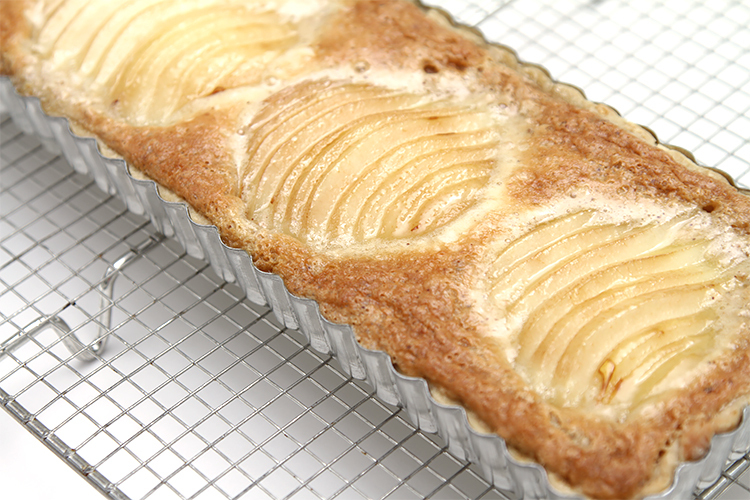 Bake the tart for 30 to 35 minutes until the frangipane is golden. Remove from oven, brush the pears with the balance of the butter-sugar mixture and let cool to room temperature. Sprinkle the tart with powdered sugar. 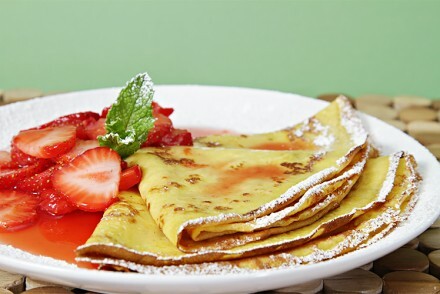 Serve each slice with a dollop of Chantilly and a mint or lemon balm sprig. 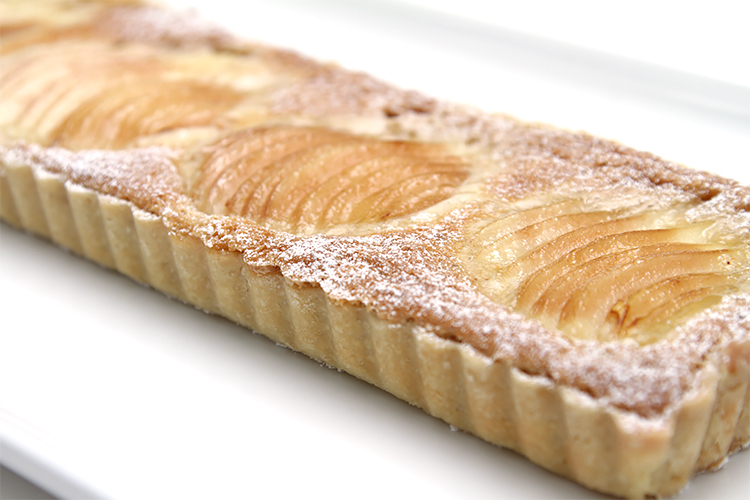 Cook’s note 1: The tart can be made up to 6 hours ahead and kept at room temperature. It is best eaten the day it’s made. If you need to refrigerate it, make sure to bring it back to room temperature before serving. Refrigeration will make the crust a bit soggy. Cook’s note 2: To toast the hazelnuts, preheat oven to 300 °F (150 °C). Place nuts on a baking sheet and bake for 25 to 30 minutes until the skins are dark brown and split open and the nuts are golden. Cool to room temperature, then rub off the skins between two clean kitchen towels. 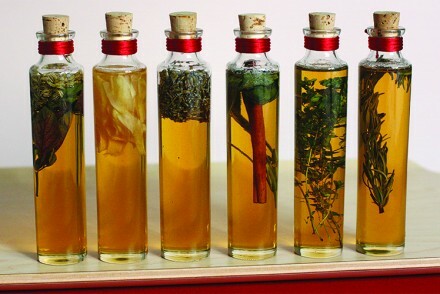 Use in this recipe right away or store in an airtight container for up to 1 month. Although the rectangular tart mold is ideal for making this tart, the recipe will work with other molds. You can use an 8″-wide x 1″-high round mold. Or make 6 individual tarts, using 4 3/4″-wide x 3/4″-high molds. But for the individual tarts, you’ll need to use 3 pears instead of 2 as called for in the recipe (half a pear for each tart). Thank you for this recipe Viviane. I love making European type desserts and this one will be a hit with my family during the holidays (along with my other hungarian delicacies). They are waiting for them as I write. One thing I need to know. What is Poire William and where do I find it? Dear Joan, It is lovely hearing from you! Thank you for your wonderful note. I am delighted you are making this tart for the holidays! Poire William is a very aromatic pear brandy. You can find it at any good liquor store (The bottle often comes with a whole pear in it!). But you could also use grappa, or even pear grappa, although that’s harder to find. Here’s wishing you and yours a most delicious and joyful Christmas… and a New Year filled with goodness. Warmest wishes from Sonoma! Do you think it would be ok to use almond meal instead of hazelnut? I have some ground hazelnut in a packet, could I toast it in a frying pan and use this? Hi Gail! Yes, you could use almonds. The best would be to use roasted almonds and grind them in the food processor as the recipe calls for. However, if you use pre-ground almonds and toast them in a dry pan, you’ll have to be very careful not to over-toast them. Enjoy making your tart! Viviane, making a pear tart over the holidays has become a family ritual. Each year one of us will make one from a new recipe or tweak an old one and then we sit around and critique it. This year we all agreed that this was THE tart to make from now on. Thank you for finally putting an end to the quest for the perfect pear tart! Hi Sim! You totally made my day… Thank you for your note and for letting me know that this tart passed your “family test”! Here’s wishing you a happy and delicious New Year! 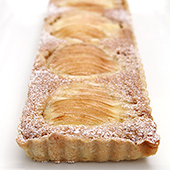 We always love frangipane and your tart is so beautifully presented, Viviane. I have guest who is will stay for dinner. They adore pears! Making this wonderful tart would make them very happy! Deb, you do spoil your guests rotten… It is so thoughtful of you to think of making something they love. Happy baking! This is so pretty, it’s just screams holiday to me. I need to try this. 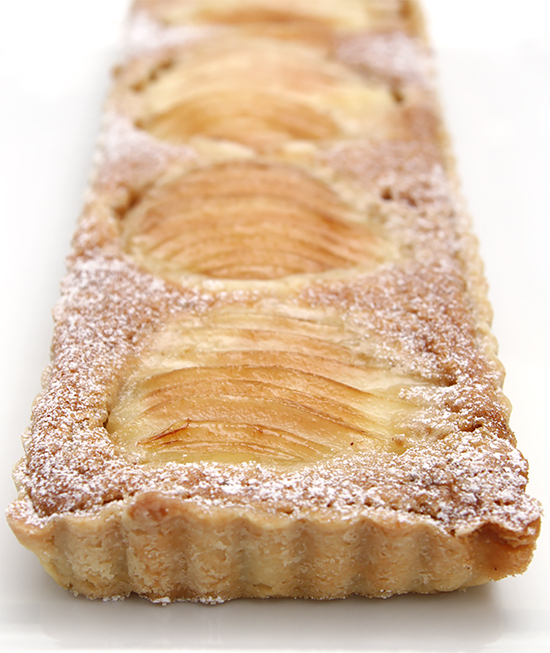 Viviane, Your Pear Tart looks so yummy. I can’t wait to make some for us. Love to you & Marc! Donna! Thank you so much for dropping by and for your kind note. We wish you and your family a beautiful Thanksgiving!